MG Triple Eight Racing duo Andrew Jordan and Jack Goff are targeting another solid haul of points as the Dunlop MSA British Touring Car Championship (BTCC) heads into the penultimate meeting of the season this weekend (26-27 September), held at the track closest to Triple Eight’s Greatworth HQ, Silverstone. 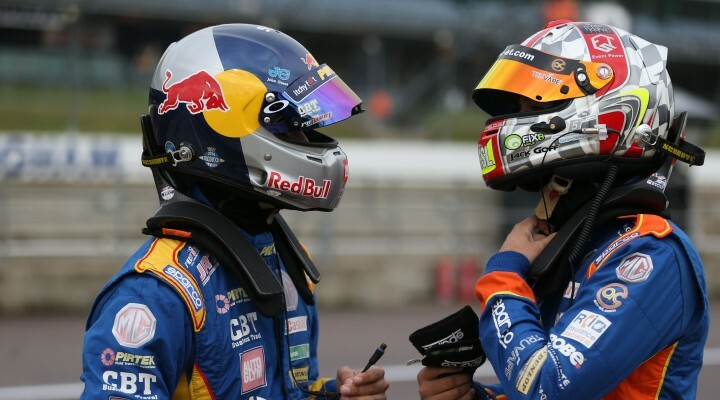 Battling hard for points at Rockingham earlier this month, both British drivers now head to the home of British motorsport optimistic of extending the MG6 GT’s exceptional run of form around the 1.64-mile National Circuit layout. Since the car’s debut under the NGTC platform in 2012, the high-speed straights and flowing corners have yielded three pole-positions and six race victories. Triple Eight Racing has also enjoyed significant success at Silverstone since its inception in 1996, with the reigning manufacturer champions having added to their strong MG record with a further five pole positions and nine race wins. Sitting fifth in the championship standings and 46 points off the summit entering the weekend, 2013 title winner Andrew Jordan still remains in mathematical contention to clinch a second drivers’ crown. Needing to leave Silverstone within 67 points of the series leader come the end of rounds 25, 26 and 27 to continue his quest of becoming a two-time champion, the Pirtek-backed driver is staying realistic on what can be achieved. Citing understeer issues at Rockingham as one of the contributing factors for his progress being blighted, the 26-year-old is keen to try new, and different set-up changes to MG6 GT in a bid to continue moving further forward. Despite not running many of the planned changes during his maiden season with the factory-supported outfit, the Red Bull athlete is of the opinion he has nothing to lose and everything to gain – filling him with optimism. Off the back of a weekend where raw speed failed to go hand-in-hand with luck at Rockingham, 5 Star Cases-backed racer Jack Goff is relishing racing at the home of the British Grand Prix. A member of the highly prestigious BRDC Superstars, which targets assisting the brightest talents in UK racing, the 24-year-old is setting his sights on producing a standout performance under the shadow of the BRDC clubhouse. Like team mate Jordan, Goff has worked tirelessly throughout his inaugural campaign with the Longbridge-based manufacturer to engineer the long-wheel-based NGTC machine forward. Highlighting qualifying in particular as being more important than ever due to how competitive the series has been in 2015, Goff is ready to put it all on the line for that one-lap which could lead to a successful race day. With just six races left to play out in the 2015 campaign, MG Triple Eight Racing are also still firmly in contention to retain the Manufacturer/Constructors championship, however both drivers will need to rally together to close the gap of 45 points to current leaders Honda/Team Dynamics. Qualifying will be shown live on the ITV website (www.itv.com/btcc) at 15:40 this Saturday with race day coverage beginning at 10:00 on Sunday and being shown on live ITV4, itv.com and also in HD.